Staring at the ceiling of our bedroom, I was feeling restless, my mind going through the chores and tasks of the new day ahead. Sleep did not fancy coming back to me no matter how I tossed and turned. Not wanting to disturb the household I tiptoed into the kitchen to fix myself a strong cup of coffee. Cradling the steaming mug of coffee between my hands I walked out onto the patio of our back garden and made myself comfortable on one of the wooden deck chairs. The quiet and solitude are like balsam to my bustling mind, massaging the anxiousness slowly away. Suddenly my senses are alert, awakened by the beauty of the new season. Spring has arrived, bedecked like a young virgin ready to seduce the senses of those who venture into her embrace. The air is heavy with the perfume of fresh moist soil, dispersing its sweet, redolent scent, which lingers in a hazy mist just above the earth. The sun begins its rise, slowly emerging over the grassy knolls in the horizon, setting the sky on fire in colors of flaming red and orange. I feel selfish to be hoarding this undisturbed, breathtaking beauty in which I hide. I watch as the sky glows in the dark, the sun rays reaching into the mist, warming it and like the veil of a bride, lifting it and kissing the ground below. Soon the air is alive with a symphony of bird songs, singing in nature’s orchestra in perfect harmony. The warm breeze blows ambrosial fragrances of early blooms from the fields below, while busy bees begin their day dashing from flower to flower gathering the early morning nectar. Lucid droplets of moisture on the new buds reflect the majestic butterflies as they gently glide noiselessly over the flowerbeds. This incredible scene unfolds within a matter of minutes before my eyes and the beauty resonates inside of me. Spring is the time for new beginnings. It creates inspiration, stimulates creativity and arouses the imagination and just like we open the windows wide, letting the fresh breezes of Spring ban musty old Winter from our houses, we allow Spring to reach deep within us and to extract and invigorate our senses that seem to have been dormant in the darker months of the year. For now the restlessness inside of me seems to be sidetracked and I know that given time I’ll get back into the swing of things. Last summer just before leaving on vacation to Norway I made a Lemon and Herb Risotto with Balsamic Roasted Asparagus and described summer in a very similar manner to this post. Little did I know that the lemon and herb risotto would connect me with a new friendship. While we were in Bergen we met with Kjersti who chanced upon my blog in search of a risotto recipe. Both our families spent a fantastic day in Bergen together and we’ve been in touch ever since. Next week Kjersti and her family will finally be visiting us in Weimar for a few days. We’ve been planning since Christmas! I cannot wait to see them again and enjoy a few relaxed Spring days together. We’ll be sipping wine, barbecuing, and creating Indian-Norwegian-German-Icelandic (Kjersti’s husband in from Iceland) fusion food together. As it was a risotto that brought us together it only seems appropriate that I celebrate their arrival with a risotto. An elegant risotto, refined with Riesling wine and earthy notes of leek and bacon. Simple yet very satisfying. Bring the broth to a boil and keep warm. In a skillet heat 1 tablespoon olive oil and fry the bacon until crisp. Remove from the pan with a slotted spoon and set aside. In a pot, heat 1 tablespoon butter and remaining olive oil together and add the chopped shallots and leeks, then on a low heat sauté very gently for 8-10 minutes until the flavors have combined and caramelized. Be careful and do not allow them to take on color. Add the rice and increase the heat. Keep stirring the rice while it cooks and takes on a glassy color - approx. 1 minute. At this point add the wine and as it bubbles, allow the rice to infuse with the wonderful aroma. Once the liquid has evaporated and the rice begins to get dry add a ladle full of broth. Stir well and add a touch of salt. Reduce the temperature so that the mixture bubbles gently. Now, keep adding the broth, a ladle at a time, and allow the rice to soak this up, stirring every now and then. When the rice has soaked the liquid add another ladle full. By "massaging" the rice this way you release the creamy starch from the rice giving the dish a fantastic creamy consistency. This whole process takes approx. 15 minutes. The rice grains should be soft but still have a slight crunch to them. Now add a bit of salt and pepper, but be careful as the stock is normally salty enough - so please taste before! Take the pot off the heat and stir through the bacon along with most of the Parmesan. Mix well and cover. Allow the rice to take on all the flavors - 2 minutes. 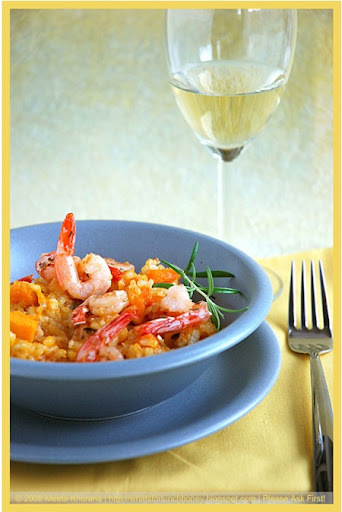 Giving the risotto this time allows it to unfold it's perfect creamy-moist consistency. Check and adjust seasoning. To serve scatter the remaining Parmesan cheese over the top and enjoy with a glass of chilled Riesling wine. These are often the simple but fulfilling dishes I like making when good friends come around. The message lies heavily on comfort, relaxation and feeling at home. Furthermore, in my opinion a risotto is a wonderful way to get your friends into the kitchen and everyone pitches in,.Bottles of wine are opened and tasted, laughter and ideas flow freely and then when we finally all sit down together there is that ultimate feeling of being surrounded by loved ones close enough to enter your kitchen and prepare a meal with you. Over on the Plate to Page blog we are currently featuring one very creative photographer who has inspired me from the early days I began with food photography. Come on over and meet Sabra Krock as she shares some awesome detail and insight into the world of food photography and styling in her post It Happened Organically. I’ll be taking a little break next week, but if I do get around to it, I certainly will share a few virtual appetizers of the food we cook up and scenery we take in. Have a great week and cook up a feast! Did you know that risotto is Hjalti's favourite? Your descriptions almost brings tears to my eyes - I can't wait for spring! I'm sure we will have sunshine in Germany, even if it's raining outside. Can't wait to see you! The skies are just marvelous! great job capturing such breathtaking beauty! great post altogether! A fabulously spring.like risotto! What a festival of flavors. Love yr pics meeta and the one of the sunrise is breath taking...cant wait to catch up with ya @ P2P next month ;-)..
love the pic of the sunrise! the dish looks lovely too. Mmm, I can taste the riesling in this. Isn't leek so wonderful with pretty much everything? Thank you for not only sharing a wonderful recipe with us, but this stunning landscape as well. I love a good sunrise just as much as sunsets... this shows exactly what it's all about. Simple, serene beauty. This is poetry Meeta! I could see the entire morning unfold before me. I could read it over and over again. And a perfect spring time meal. Stunning! I often feel the same way when I wake up early in the morning (or can't sleep at night), and go out onto my porch and watch the sky awaken. I always feel it is a performance put on for me alone! That risotto looks perfect for Spring! And those photos! Love your description of the advent of SPring and the beauty of nature, as you see it. I saw it through your words. Thank you. Risotto is always a favourite around here at Chez Cooksister and I love the flavours of this one because they remind me of a certain tart that we made back in July... ;o) Love the stripey cloth too! Adore a nice Riesling to cook with and to drink. As an almost obsessive risotto eater I haven't made it with leek and bacon before and wondering why on earth not. To be remedied. I love your lemon herb risotto (I made a version myself) and this is equally as lovely! I love risotto and make it quite often. This looks like a must try to me. Enjoy your break! Beautiful thoughts and yes spring is here in all of her warmth and beauty. And nothing better to celebrate the change of season and new friendships than a wonderful risotto. Perfect! My mouth was watering just reading this post. Bacon is one of my favorite food and riesling is one of my favorite types of wine, so I have no choice but to make this as soon as possible. WOW WOW WOW WOW I can't believe this recipe has basically ALL my favorite things in the world! Riesling AND risotto AND bacon?!?! Count me in. PLEASE someone enter this in Paula Deen's competition!! Missing you Meeta... and a gorgeous refreshing post as always! All good? I love how you are inspired by the nature around you! It's fascinating! I've never really experimented with leeks before. I'm very interested to try them now. Do you have other leek recipes you could share? Yum! You had me with the title alone. I will certainly be trying this recipie the next time I buy leeks.